A Devon coach firm which was stripped of its operating licence is to cease trading, managers say. 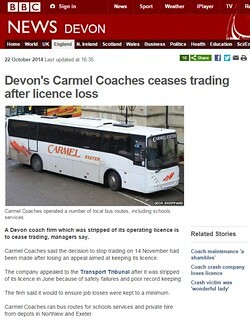 Carmel Coaches said the decision to stop trading on 14 November had been made after losing an appeal aimed at keeping its licence. The company appealed to the Transport Tribunal after it was stripped of its licence in June because of safety failures and poor record keeping. The firm said it would to ensure job losses were kept to a minimum. Carmel Coaches ran bus routes for schools services and private hire from depots in Northlew and Exeter. Sarah Bell, traffic commissioner for the West of England, revoked its licence and those of two of its directors over "woeful failures" and safety concerns. Issues included serious defects not being fixed and poor record keeping of safety issues over a number of years, she said. The appeal heard the firm's MoT failure rate was double the 18% national average and one brake defect was reported eight times before something was done. At that hearing, company director Tony Hazell admitted the firm had expanded too fast but said maintenance had improved. Speaking of the company closing, Mr Hazell said arrangements "are being made for all future contracts and bookings to be honoured". He added: "We are working hard to ensure staff find continued employment and job losses will be kept to a minimum." One of the firm's vehicles was involved in a coach crash at Looe in Cornwall in May where two people died although no defects were found. The traffic commissioner said she gathered her evidence before the crash and her decision did not reflect the incident. NORWICH BUSES: Norwichbuses Blog Time Capsule - Norwich minis A shorter than usual post from this series today, providing the usual historic entertainment. That is very true. I don't know how that company is still going either! I read the report and they thoroughly deserved it. I feel so sorry for the ordinary staff, though. As for the medium sized company in Plymouth, I'm sure their time will come if they don't buck up their ideas.